I've been promising this recipe for about a week now, and here it is! At our house, we are just traditional lasagna people (i.e. Brown Bottle Lasagna), but my husband's cousin made this for him last year while he was staying with them for work one week. And when the husband comes home talking about a recipe, I know it has got to be good. He's not exactly a foodie. So I asked her for the recipe LAST YEAR, and I just got around to making it. But, I will be making it again and again, as it is a keeper. In a large saucepan on LOW heat, melt butter, and add flour. Whisk this mixture for a few minutes and it will become your roux. Slowly stir is milk or half and half and lemon juice, continue whisking for 4 minutes. After this starts to thicken a bit, add in mushrooms, chicken and all seasonings. In a separate bowl mix ricotta cheese and parmesan cheese. I opted to also add a little garlic salt to this mixture as well. Preheat oven to 350 degrees. Spray 9x13 pan with cooking spray. Line bottom of pan with small amount of white sauce, then start layering - noodles, ricotta, white sauce, mozzarella cheese, until layered to the top of the pan. Bake for 40 minutes or until bubbly and brown. Clearly, I did not like my portion. This is another dish you can make the day before and keep in the fridge, or easily double the recipe and freeze one pan for later. Yum...like I said it is a keeper. As for our day, it is about as dreary as it can get outside. So, it is a perfect time to price all my items for my garage sale. Yep - my sister and I are having one later this week. I LOVE GARAGE SALES. I know many people hate them, and I just can't understand why? Crazy people fighting for your stuff, bargaining to bring your price down by a quarter, and you get the profit? Sounds like a good time to me. Are you a garage sale lover or hater? I'm a garage sale non-lover. I just can't be bothered. I'm sure there are great finds, super steals, but I can't make myself go to them. I actually hate tomato sauce, so this lasagna sounds SO GOOD to me. I like HAVING garage sales, but I can't even find anything worth it to me at others. Thanks for the recipe! I love lasagna!! I don't go to garage sales very often. I've never held my own. Excellent! I love white lasagna, I usually add broccoli to mine. Thanks! That sounds SO incredible. LOVE the square plate! 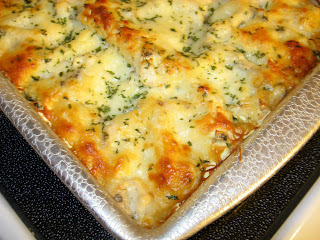 Ally- I am glad you liked the white lasagna! I wondered if you had tried it yet! It is hard to have just one portion!!!! I think I will add it to my grocery list this week as well. Give lil man kisses for me! I just had a garage sale last weekend and did pretty good..it's a good way to get organized and make a little extra cash too! Bet my fam would love that lasagna! I don't like to go to garage sales, but have *hosted* 3-4 in my day. One year we made enough to buy a new dishwasher!!! Yum looks good! 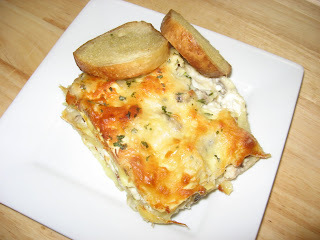 I've had a white vegetarian lasagna before and it was delicious! I love going to yard sales but don't enjoy hosting them so much. First of all you have to get up early and I'm not a morning person. Then I hate when people steal. The past few yard sales we've had con-families w/ an obvious plan come and steal from us. Even with 3 or 4 people manning the sale and watching they confuse you, bargain, move things, swap tags, etc. to distract you. Then the next thing you know they're gone and you notice a few things missing, or price tags on the ground that they swapped out. I hate the dishonesty of it - it was $2 to begin w/ - do you really need to rip me off?? Back in NC we would make hundreds of dollars from our yard sales and clear out all of our unwanted clothes. Here I've hosted 6 I think? and the most I made was around $40 and I've sold TWO SHIRTS that entire time. I guess just not a major yard sale town? I have those same plates!! Can you believe I've never had a garage sale? I hope to have a yard sale within the next month and hope its successful. I make a similar lasagna , that's called Caesar lasagna with alfredo sauce. I may have to try this! This looks AMAZING!! I love your plates! They are cute! I like to have garage sales, but I don't enjoy going to them! Hey girl, we can go to garage sales together. Forget the ones who hate em! haha. Yum! This recipe makes me wish my boyfriend liked mushrooms because I should definitely not make this just for myself...could be dangerous! I'm pretty middle of the road when it comes to garage sales...I don't seek them out but when I do go to one, I love all of the random stuff! Your lasagna looks really good. I think my kids are going to like this. Lasagna is their favorite dish and I've been making different lasagna versions for them (in as much as I can, lol!). 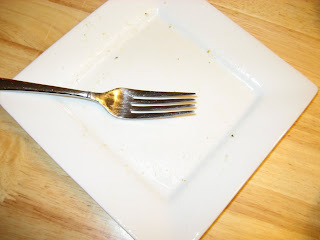 Last time, I made a butternut squash lasagna and they loved it. I'm quite positive that they're going to like yours, too. Thanks for sharing by the way. I was just thinking to myself what can i do with chicken breasts thats different...i think this might be it...I just found your blog and am so thrilled to start following! thanks so much for the awesome recipe! Oh my gosh - this looks amazing and I want to try it now!! Thanks for sharing. I am a garage sale hater - both going to and planning/hosting. I just can't get into buying other people's stuff and I don't like all the effort you have to put into hosting one. I'm so lazy. I've never had white lasagne but your recipe looks delicious. I have to confess I don't like garage sales - I'm not good with going through other folk's things, and I would only end up buying something I didn't really need! I hope yours goes well though. I LOVE!!! lasagna and this one sounds WONDERFUL, but best of all YUMMY!!! Just the way my family like it. This looks wonderful. I may have to add it to the menu for the week. Just found you site, and love it! The lasagna looks amazing, I will try it next weekend. We love garage sales, just got back from some! messy. With makers like free of cost local community sweats, Scoop the store, 2B Free, Rebel Yell sweats, Hollister, Abercrombie and Fitch and James Perse. ollister, Abercrombie and Fitch and James Perse.